New Delhi, August 9: Rajya Sabha on Thursday unanimously passed a constitutional amendment bill to restore the original provisions of the Scheduled Castes and the Scheduled Tribes (Prevention of Atrocities) Act. 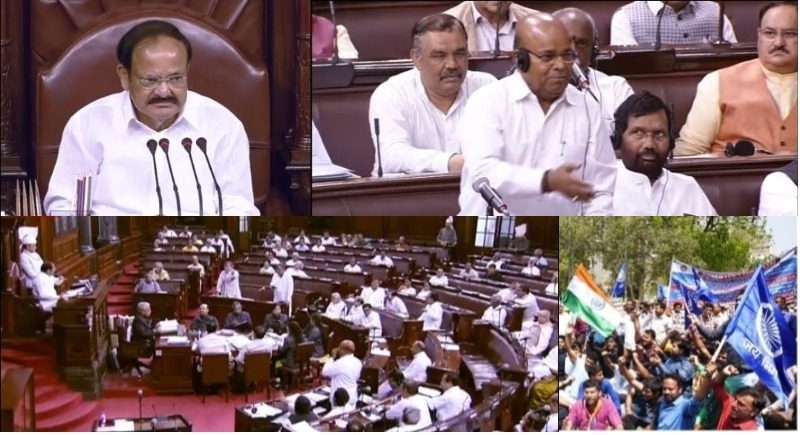 Notably, Social Justice and Empowerment Minister Thawarchand Gehlot introduced the constitutional amendment bill to restore the original provisions of the Scheduled Castes and the Scheduled Tribes (Prevention of Atrocities) Act was passed by the voice of vote as all stood in favour. During the discussion, Minister Thaawar Chand Gehlot says that when Atal Bihari Vajpayee was asked if his government will be run in the ‘Manuwad’ way or the ‘Bhimwad’ way, he answered it will be in the ‘Bhimwad’ way. While Kumari Selja of the Congress says that every 15 minutes there is a crime against Dalits. However, now we can expect that the Dalits and Marginalised will halt their protests, Bharat Bandh, violence etc. The SC/ST Act was passed in Lok Sabha on Monday this week. Last week, Narendra Modi led BJP government at centre decided to overturn the ruling of the apex court order on SC/ST (Prevention of Atrocities) Act. To stop misuse of Scheduled Caste and Scheduled Tribe act, the Supreme Court on March 20 this year said that there shall be no immediate arrest in cases lodged under SC/ST Act against public servants. To stop misuse of Scheduled Caste and Scheduled Tribe act, the Supreme Court on March 20 this year said that there shall be no immediate arrest in cases lodged under SC/ST Act against public servants. On August 1 this year, Narendra Modi led BJP government at centre finally decided to overturn the ruling of the apex court order on SC/ST (Prevention of Atrocities) Act.